Are you searching for ways to support your child’s development? Music is a fun option and a creative outlet to consider. It has many wonderful benefits for children, including teaching the mind and body to work together. A piano is an excellent choice for aspiring musicians and with the right tools and knowledge, it’s certainly an achievable hobby. No matter the age of your little one, you can find a keyboard piano out there for them. Let’s get started by checking out the benefits, what to look for, and finally, our list of favorites. Use the links above to check the latest prices or read our in-depth keyboard piano for kids reviews below. Introducing your child to the piano is just one way to encourage creativity, but did you know there are numerous other benefits that learning an instrument can offer your child? Below we delve into just a few of them. When learning the piano, your child will eventually remember which keys make what sounds. As your child gets older, they will learn to memorize notes, chords, and scales. Maybe they’ll even put together a song to play for you. Research shows that students who study music also achieve better grades in other subjects. Therefore, your child’s memory recall for other types of information can benefit from the musical training as well (source). It might be obvious that learning to play the piano comes with learning to distinguish different musical tones. But as your child grows, their ability to process sound away from the piano can also increase. This means it can boost your child’s reading and speaking abilities, and maybe even assist them in learning a new language (source). More than anything in the world, your child wants to please you. With positive feedback over their musical accomplishments, it will surely leave them feeling proud. This confidence can help in other endeavors as your child gets older, such as speaking up in class without feeling shy or when interacting with new people. Developing fine motor skills is necessary for children to complete daily functions independently as they grow older. Think about all the tasks that require controlled use of the hands and feet, from tying shoes, to writing with a pencil. In a study conducted by the University of Texas, two groups of children were monitored: one group who took piano lessons, and another group who didn’t. The children who played the piano had much faster responses overall (source). What you need in a keyboard piano depends primarily on your child’s age. For a baby or toddler, start with something fun, one that features characters, music, and lights. If your child is older and interested in pursuing this as a serious hobby, you’ll need to find a more advanced and long-lasting instrument. Here are some things to consider. A traditional piano has 88 keys, which could be overwhelming, and unnecessary, for most starting out. 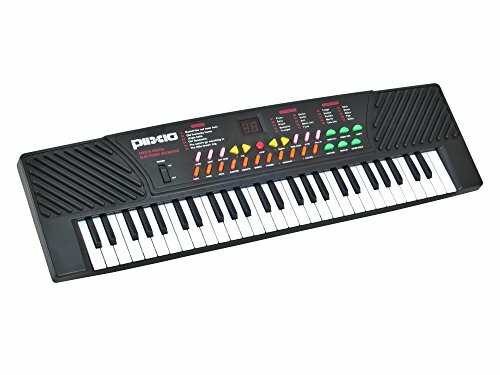 For your young beginner, a keyboard that has between 25 and 61 keys is a good place to start. 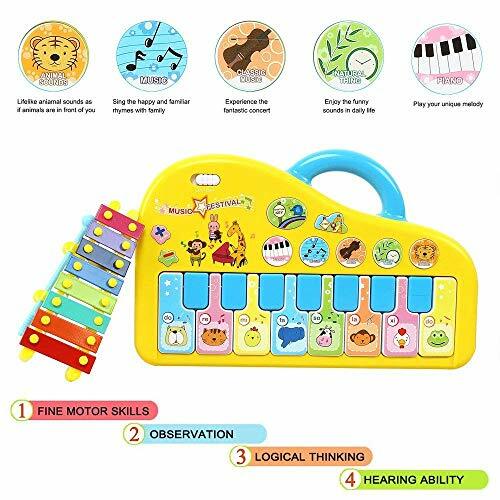 We recommend trying to find one with keys in similar size to that of a regular piano, so that your child can learn how to place and space their fingers properly. Acoustic pianos don’t require electricity to make their wonderful sound. Inside the piano, there are felt-tipped hammers for each key. Every time a key is pressed, the hammer will strike the appropriate string. It will give your child the real feel and tones of the piano. An acoustic piano can sustain a note for longer. It’s durable and parts can be changed or fixed easily. Digital pianos are electronic, and more versatile, particularly for children. Almost all of them will have a variety of features/sounds that you won’t find with the acoustic. Some might have touch-sensitive keys which means they make a louder or softer sound depending on how hard you press. It’s lightweight and can be moved if needed. There’s no tuning required, so it’s easy to maintain. Most come with a wide range of features. Cost: a digital piano will be significantly less than an acoustic version. Now that you know the difference, it might be easier to make a decision (source). Kids like to have fun, right? A boring old piano that only makes that true piano sound might not be the most interesting for your child in the beginning. You might want to consider finding a keyboard that can switch between instrument sounds. Or one that enables your child to record their music and then replay it. Some keyboards will also have different rhythms your child can play along to. For the young ones, games are a great option for getting them excited about this new instrument. You could also ask them to create their own melody and perform it for mommy and daddy. Make a schedule for your child so they’re able to keep track of their practice, and gain discipline in the process. Don’t forget to praise them for meeting these times. Other activities: Decide how many hours of practice a week are realistic for your child, along with their other hobbies and responsibilities. Start slowly: Build your child’s practice time slowly so they don’t suffer from burn-out or lose interest early on. What it means to your child: Will piano be just a hobby or are they more serious about playing? Encourage a balance between fun and discipline, and see where it takes them. Take note of your child’s cues. There will inevitably be music they love to play and music they do everything to avoid. Find songs your kiddo loves, making sure they are simple and easy to follow for young beginners. A piano teacher might be a good choice if you want your child to learn more. Remember to choose the tutor carefully. You may also want to take lessons along with your child, who knows? Let your child play around first: Getting straight down to business might scare or bore them. If you have fixed practice times: Make sure they are hours when your child is fresh, fed and happy. Choose the right location: This could make or break the piano fun. If it’s placed in a closed-off room, your child is less likely to want to sit and play. Find a nice location, maybe near the kitchen or a sitting area — but away from the TV or other distractions. Invest in a good stool: If it can be adjusted, even better. To be comfortable while playing, you need to be a little higher, so you don’t have to lift your arms while playing. Incorporate music into your daily lives: Play music of all genres on the radio, in the car and at home. When your child sees you enjoying a few tunes, they’ll likely feel encouraged to play and sing more (source). Now that we know more about what to look for when buying a keyboard piano for your child, let’s tune into our top 10 and see what’s available. Toddlers love to use their whole bodies when playing, so we should let them go wild once in a while. A keyboard playmat is a perfect place to expend all their extra energy. Since it will be stomped and danced on, it also needs to be durable. This keyboard is recommended for one-year-olds and over. At that age, children are usually taking their first steps. Letting them play around on a “magical carpet,” with a new tune at every step might make walking even more exciting. With this playmat, your child has 24 keys to experiment with. If you have a toddler who gets bored quickly, the playmat has eight instrument sounds to play too, including the violin, trumpet, banjo, and more. There are also record, playback and demo modes, so you can record your tot’s own dance tunes! The playmat is made out of a highly durable vinyl material that can take plenty of stomping. It could even be a fun activity at a kids party. A wide range of features and modes. Fun for babies as well as older children. Can be folded flat and stored easily. Seems to be on high volume when first switched on. The best way to help your newborn develop their senses of touch, hearing, and sight, is through play. As your little one reaches the babbling stage, he or she might love something to “goo and gah” along to. This keyboard has a few surprises, so don’t be fooled by the size. Your baby will get to play around with animals, instruments, and numbers. Also, it features some classical tunes instead of the usual nursery rhymes. Studies have shown that listening to classical music will stimulate the production of endorphins in your child’s body (source). Around the same size as a magazine, the play piano is compact, but that isn’t a bad thing. You can easily fit it in your bag and then pull it out whenever your baby needs a little distraction. Different textures, including soft keys. The keyboard section only contains one key and one tone. Not so easy to clean between the gaps. 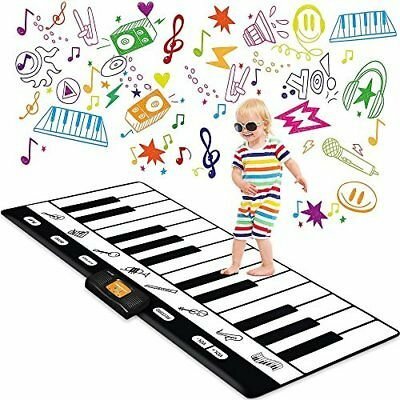 Young children have a wonderful imagination and, when buying a musical keyboard, you might want to look for something with a variety of options for your explorer. This way, they won’t get bored easily, and they have the chance to see what noises appeal to them more. If durability and functionality are just as valuable to you as a fun time, pay attention. The AresKo keyboard has a safe, rounded shape, so there are no harsh edges. The handle is also reasonably large, to help your tot carry it around. Your kiddie will also receive multiple mode options with this one. The keyboard plays different voices, as well as a wide range of animal sounds. Your tot will also get to use their imagination while exploring sounds found in their surroundings, such as water, clocks, and more. It’s made out of a non-toxic ABS plastic, so you won’t have to worry too much if your child likes to use their sense of taste as well! The buttons are easy to press for small fingers. Three AA batteries are required (not included). This keyboard comes with a free xylophone, as well. Large handle for easy grip. A free xylophone is included. Made of a non-toxic material. The xylophone is very small. Some keys can get stuck occasionally. Toddlers can be loud at times — especially as your little one starts to talk. Encouraging your child to use their voice through play and music can help direct some of that energy elsewhere, and get them in the music zone before you know it. With gain comes sacrifice — in this case it might be your quiet time. This light-up keyboard will give your toddler 37 keys to play. Sounds include piano (of course) plus other instruments, such as the violin, trumpet, and even a music box. It also offers a range of animal sounds such as frog, cat, and dog. Eight rhythms to play along to include rock, samba, and more, helping your child create their own songs and beats. The playback feature lets them record and listen to their creations. The microphone is built in, and has its own stand on the keyboard. A little stool is also provided, for your young musician to sit comfortably while playing. The microphone can be held by hand or in a stand. Microphone and speaker can create feedback when they’re too close to each other. Though toddlers are great at exploring, they're not always the most careful. I have seen my fair share of expensive toys fall apart during rough play. For rowdy toddlers, it might be a better option to look for something a little cheaper. If you’re a person who likes to get the most out of your money, this multifunctional piano could be worth a look. It looks like a miniature grand piano, but it can do more than just play piano tunes. 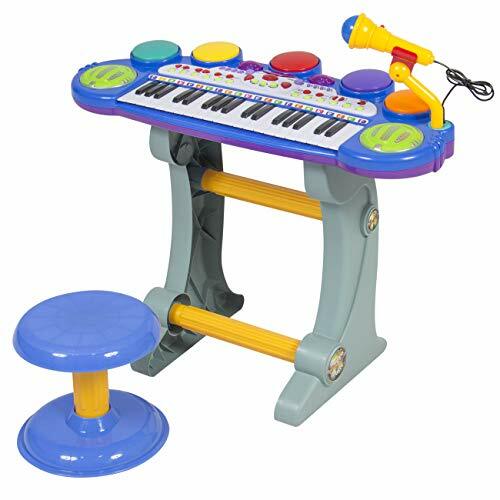 It has 24 keys and your tot can choose between a variety of drums and other instruments. There’s also a music box and different rhythms, such as disco and tango. You can adjust the volume as desired, and your child can play around with the tempo. Your little one will also get to use their vocals, and maybe even record a song using the built-in microphone. It comes with a cable for you to hook it up to a speaker or iPad. This enables your child to show off their skills, and you could even play along. Requires four AA batteries and a 1.5 volt battery. Advertised as suitable for 1-6 years, but is actually very small. Watching your child fall in love with music is one of the best feelings. If you want to give yours a good headstart, getting them a grand piano might be the way to go. However, a grand piano is, well, grand. So why not start with something that will actually fit easily in most living rooms? 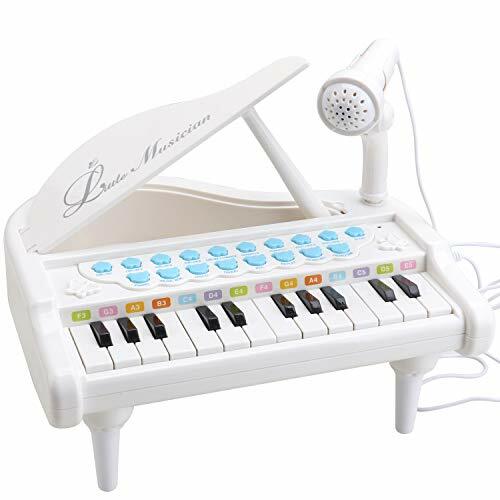 If you want to give your child a gentle push in the musical direction, this mini piano might help. It looks very similar to a real grand piano, although this one only has 30 keys. Put it in your child’s room or playing area and let them be free. To make it even more like the full size version, it comes with a stool and a note holder. The stool is not adjustable, so smaller children might need an additional cushion or pillow. The piano is made out of hardwood and it has an elegant glossy finish. You also get to choose between all black or white. There are no extra features or sounds, and it only plays like a piano, but that shouldn’t be a bad thing. If you want your child to be introduced to the art of music without distractions, this could be a good way to go. Suitable for ages 1 to 5 years. Stool and note holder included. The 30 keys offer a nice range to play with. The tones sound “toy-like,” not similar to the piano. The stool is not adjustable. If your child is starting to show interest in playing the piano, it's important to harness this enthusiasm and help them along. As your child begins to play, it's essential they get to practice on a real keyboard. By doing this, they get the feel of the instrument, it will also make it easier when they begin to play the piano. This electrical keyboard is not only for kids, it could also be useful for older beginners. It’s portable and light, so your child can bring it to school or lessons if needed. 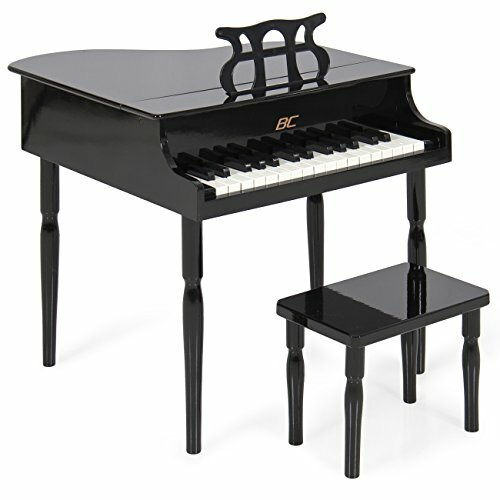 It can be played using batteries, or you can plug it into an outlet for unlimited piano fun. There are 54 keys for your child to get accustomed to, however, they are a little on the small side in comparison to a piano. Regardless, it’s a good way your child to start learning the placement of the chords. There’s also an electrical keyboard setting, this will give your kiddo 20 tones and rhythms to play along to, as well as six demo songs. You little pianist can create amazing music, record it, and then listen to it over again. The keyboard also has a lesson mode, where your child gets to learn the different notes and chords. Good range of sounds and features. Weighs just under 3 pounds, so it’s portable. It’s not easy to switch between different modes. Children who want to play the piano often have to travel to lessons. Or your child might need a keyboard in school. Being able to bring their own easily has its benefits — no sharing, or waiting for someone else to finish before getting their turn. With a portable keyboard, your child can also practice anywhere, even in the car, if the size allows it. If your child loves to play the piano anytime, no matter the location — something like this foldable keyboard might be highly appreciated. It can be rolled up, so it fits in a backpack. The speakers are built in, and your child can also insert headphones if they want to play for themselves only. It’s made out of waterproof silicone — which also happens to be a food-grade material. There’s the possibility of connecting the keyboard to your computer, using a “MIDI” cable — although this is not included. Then you can edit the music as you play, or record it on the computer. You might be thinking that a foldable keyboard can’t be very realistic. However, there are 61 keys, very similar to a real piano. The feel, of course, won’t be the same, but it could be good finger-placement practice. There’s also a massive range of tones and rhythms to choose from, as well as 40 demos. Connects to a computer for production options. Built-in battery or uses external power supply. Keys are sometimes unresponsive when pressed consecutively. The smooth surface makes it difficult to distinguish between keys. These can actually be very effective in helping your child learn how to play. Smart pianos typically have a screen that allows your child to follow movements. Or, they allow you to plug in a phone or tablet for increased options. Learning to play the piano takes years. Your child has to stay focused in order to become proficient, but this smart piano might make it a little easier. There are 61 keys, which light up to guide your child on where to place their fingers. The keyboard allows you to plug in a phone or iPad, where you can download an app. In the app, there are crash courses to learning songs, there are also arcade games that focus on learning to play. This one also has a MIDI output — similar to the foldable piano — where you can connect it to your computer if you want to edit or record. It could make the process of learning more fun for your child. It might also be easier for children who struggle with the “traditional” way of learning the piano. Featuring LED keys and app. Suitable for older children and adults. Works with outlet and batteries. Keys have a very light touch, unlike a traditional piano or keyboard. Your child might not learn the traditional fundamentals of piano-playing. As your child gets older, they might need a little more than a simple keyboard. Giving your child a place to be creative while learning can make it more fun. It's also essential that they have a real keyboard, to give them the authentic feel of the instrument as they play. Having a comfortable setting for your child to practice can potentially make or break their interest. This keyboard comes with a padded stool and adjustable stand. So your child can play sitting down or standing. You can also take it off the stand and place it on a table if desired. The keyboard includes headphones, if your child wants to play for themselves. There’s a noteholder which can easily hold an iPad or a smartphone as well. 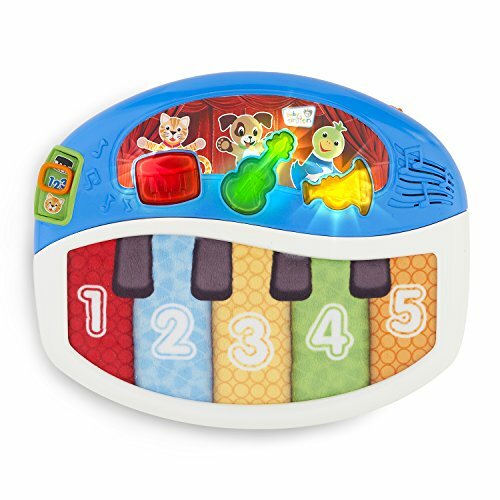 The keyboard features 100 sounds and 100 rhythms, as well as 50 demo songs for your child to practice with. RockJam offers a one-month free membership to the “Simply Piano” app, filled with songs to choose from. You will also receive two months of free face-to-face lessons via the app. The stool and keyboard stand can be folded for portability. Some reported that the keys are stiff. Letting your child rock out on a piano from an early age has an endless list of benefits. You might even learn a thing or two as well. 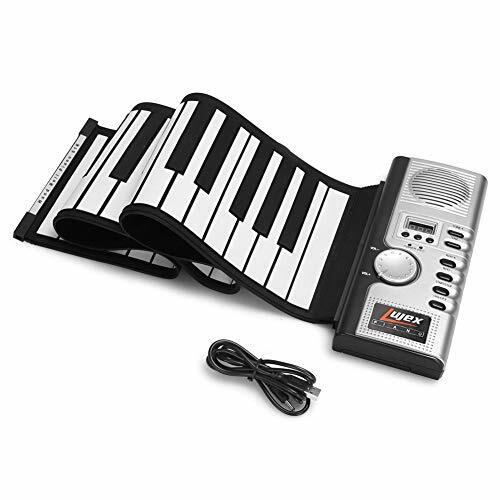 If I were to get a piano for my preschooler, I would probably choose the Lujex Foldable Keyboard. It’s easy to pack and appropriate for the age range; older children can use it, too. 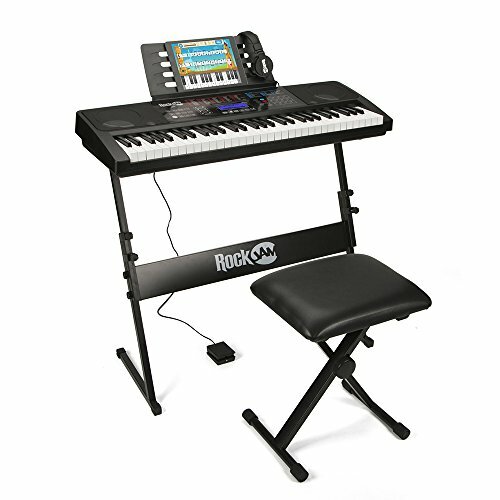 However, you might want to choose something like the RockJam Keyboard if your child is older and more serious about playing. 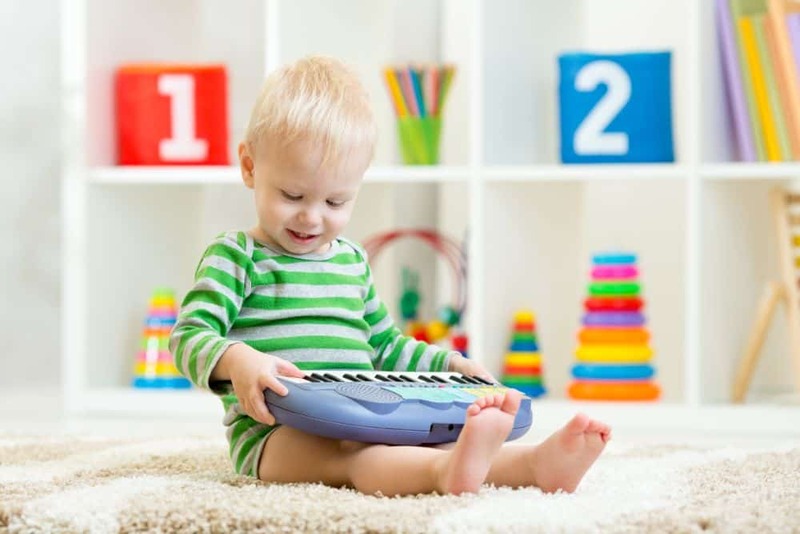 Does your child already play the keyboard or piano? Did your parents make you take piano lessons growing up? Has this helped your decision? Leave a comment or two below — and remember to share!